2. Add the pineapple pieces and pour enough water until the pineapples are fully covered. 4. After 5 to 7 minutes (or until pineapples become tender), remove and keep aside. 5. Whisk the curd well. 6. Add salt, boiled pineapples, cumin powder, sugar and mix well. 7. Add pomegranate seeds, red chilli powder and green chillies. Tip: If desired, add grated coconut. 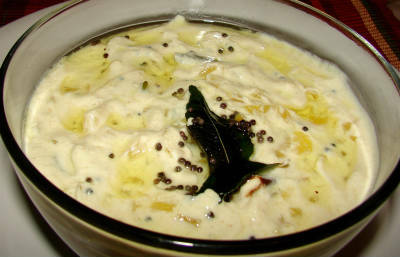 Feel free to comment or share your thoughts on this Pineapple Pachadi Recipe from Awesome Cuisine.